Our guests will be picked up from the hotels and visit the following places during the day. The heart of the “Old City” from where the Byzantine and Ottoman Empires were ruled. Ayasophia was built in 6th century as the biggest church of the world and then converted into a mosque in 1453. It became a museum in 1934. Blue Mosque, famous with its blue İznik tiles and unique with 6 minarets, mosque was built in the name of Sultan Ahmet. Hippodrome was the center of chariot races, and political activities of the old city. Serpentine Column, Obelisk of Theodosius and German Fountain of Wilhelm II are the monuments decorating the Hippodrome. Grand Covered Bazaar, most attractive shopping center and nearly 4000 shops selling antiques, jewellery, gold, carpets, leatherware and souvenir. Topkapi Palace, was the administrative center of the Ottoman Empire. Rüstem Paşa Mosque, was designed by Ottoman imperial architect Mimar Sinan for Grand Vizier Damat Rüstem Pasha. Spice Bazaar, famous with its exquisite and colorful tiles set in floral and geometric designs. 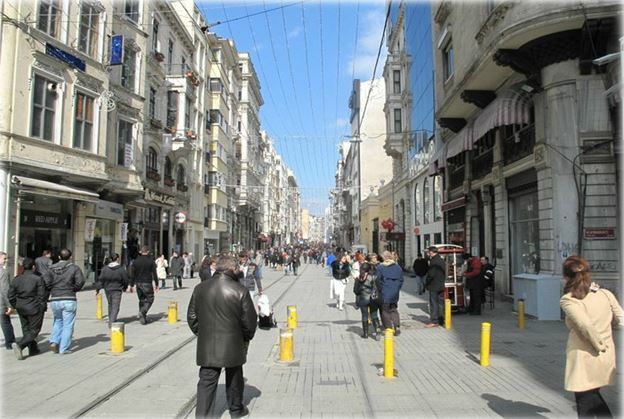 İstiklal Avenue or Istiklal is one of the most famous avenues in Istanbul, Turkey, visited by nearly 3 million people in a single day over the course of weekends. Located in the historic Beyoğlu district, it is an elegant pedestrian street, 1.4 kilometers long with bookstores, art galleries, cinemas, theatres, libraries, cafés, pubs, night clubs with live music, historical patisseries, chocolateries and restaurants. The Galata Tower is a medieval stone tower in the Galata/Karaköy quarter of Istanbul, The Tünel is a short underground railway line in Istanbul, Turkey. Dolmabahçe Palace located in the Beşiktaş district of Istanbul, on the European coastline of the Bosphorus strait, served as the main administrative center of the Ottoman Empire from 1856 to 1922. Our guests will be picked up from the hotels and these places is included our tour program. The Eyüp Sultan Mosque is situated in the district of Eyüp on the European side of Istanbul, near the Golden Horn, outside the Walls of Constantinople. Built in 1458, it was the first mosque constructed by the Ottoman Turks following the Conquest of Constantinople in 1453. The Church of the Holy Saviour in Chora (Turkish Kariye Müzesi, Kariye Camii, or Kariye Kilisesi — the Chora Museum, Mosque or Church) is considered to be one of the most beautiful surviving examples of a Byzantine church. Eyup Cemetery, Mihrimah Sultan Mosque and Pierre Loti Hill are also visited in this tour program.